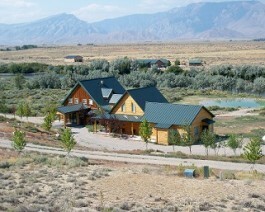 The Clark’s Fork Guest Ranch is located in the Clarks Valley of Wyoming. A luxury vacation destination for you to relax and enjoy the adventurous outdoors awaits! Enjoy fishing, culture, nature, big game hunting, winter sports, seasonal activities as well as the beautiful mountains, rivers and sunsets in this area. There are eight separate suites. Two luxury suites include lofts and a Jacuzzi in their master baths. In addition to the two suites, there is a large ADA compliant suite with king size and queen size beds, 4 smaller suites, each have queen size beds and private baths and two bunk house units that have twin beds. Several of the suites have mini bars with refrigerators. Open May-November. Pets welcome.